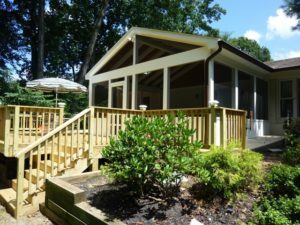 Experience the great outdoors at home with a custom designed porch addition or enhance your current deck or front stoop. With the variety of materials and features, your project will be unique. Browse our gallery for design inspiration and begin creating your dream space. EVERGREEN Fence & Deck’s professional staff will help you design your exterior living space for your intended use and to match your home’s architecture providing you years of enjoyment. We have been proudly building porches & patios for homeowners throughout Montgomery County and Howard County, MD for over 20 years. EVERGREEN Fence & Deck in Brookeville, Maryland, is a porch & patio contractor with a reputation for high quality workmanship and service in all of Montgomery County, MD, Howard County, MD, and surrounding areas including: Olney, Columbia, Clarksville, Catonsville, Damascus, Beltsville, Darnestown, Chevy Chase, Clarksville, Ellicott City, Gaithersburg, Germantown, Glenwood, Rockville, Bethesda, Jessup, Kensington, Laurel, Mount Airy, New Market, Potomac, Silver Spring, Wheaton, and Woodbine. As a local, owner-operated company, we take pride in our attention to detail and in communicating with our clients, ensuring full satisfaction in each and every job. Give us a call today for a free quote on a porch & patio addition for your home or business.